Tiffany has been in the internet marketing industry since 2013 and took a fancy to PPC when she started with us. On a daily basis, Tiffany will do anything from managing and updating PPC accounts, search/manage inbound SEO links, and she is also our client rep for those clients that are on our PPC only program. Ad extensions offer a great way to highlight your ads among your competitors – or more simply put, a way to take up more real estate in search results. At White Stone Marketing we pride ourselves on bringing results-driven objectives to your marketing plan and the use of ad extensions is just that. I will outline the main extensions that we use on each of our client’s PPC accounts and the impact they have on your PPC campaigns. The primary use of sitelinks is to create additional, relevant links for users to click. They can help customize what you offer, assist in seasonal promotions, promote local events and enable potential guests to ‘click-to-call’ your front desk from your ads. Sitelink extensions allow you to show additional links to your site below the regular ad copy. They can take people to specific pages on your site—your rooms page, specials page, wedding page, photo gallery and more! Callout extensions are automated extensions that show additional text with your ads and help potential guests instantly find out more about your products and services. They can give a significant boost to your return on investment! Location extensions allow you to extend your AdWords campaigns by attaching your business address to your ads. As well as the description lines and URL that appear in your ad text, your ad can also feature your business name, address, and phone number. 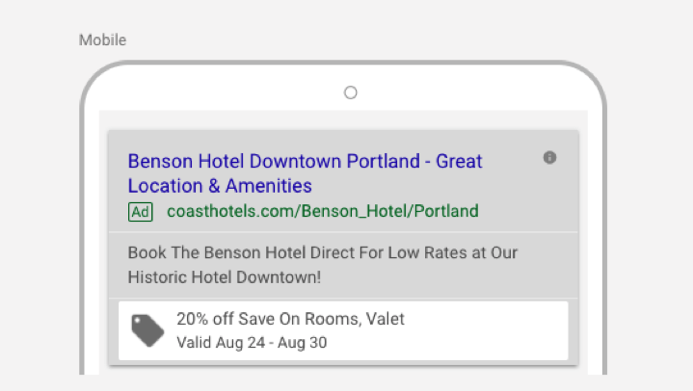 Price extensions can add more value to your text ads by giving you a bigger showcase for your amenities and room types and by linking them directly to their specific landing pages. They show as a set of up to 8 rooms that people can view to see different options and prices. Call extensions let you add your phone number to your ads, which can significantly increase click-through rates. When your call extensions show, people click a button to call your business directly. That means more customer engagement with your ads, and more chances for you to get and track your conversions. 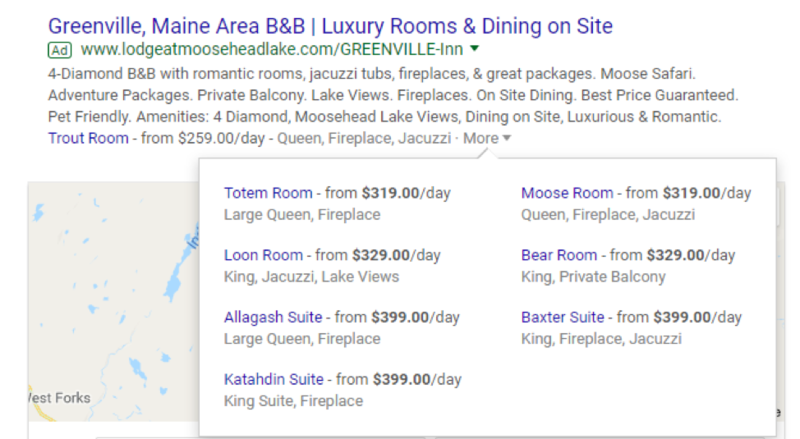 Holiday/special marketing throughout the year – one of the most effective ad extensions we have seen from Google. Promotion extensions create an additional offer into your overall ad message to attract customers that are searching for special offers and sales relevant to your accommodations. Use promotion extensions to include monetary or percent discounts for your services during holidays or special events. The holidays will come and go before we know it, and there is no better time to ensure you are advertising all the promotions you have available! These are relatively new and we are excited to see the potential they can bring to your business, so take advantage of them for year-round promotions. One final thought when it comes to optimizing your PPC accounts. We can create killer PPC campaigns, ads and extensions in your account, but without an optimized and stellar landing page, they won’t be successful. Traffic acquisition is only part of the search marketing formula. In addition to directing people to your website, you need it to be optimized to make it easy for audiences to learn about your accommodations. This will directly influence the cost of your AdWords account. If you have not received a new website design from White Stone Marketing in the last five years, we strongly suggest you speak to your rep about your options to further enhance your marketing efforts.